Nearly a week ago we drove 100 miles away from home and made our way mid-morning through the sultry heat and thick NYC traffic. We reached airport just in time, trying to save every bit of it for the last minute togetherness. We hugged D for one last time, in much of an emotional goodbye this time over the last year. Our little girl is now big enough to understand what separation in true sense means and what it is like being away from her dad for couple of several months, much of which she hadn't known all this while. We left our soul back at home that served us for these 3 worthy months of time off and family time with D. Filled with beautiful memories of home and travel, spurred with endearing moments of togetherness, we left for our home back in India with a heavy heart. Across we flew passing by oceans, green pastures of Europe, desserts of Middle East, traversing continents and surging ahead of the horizon, witnessing the dawn and dusk twice in 24 hours. As much my eyes were filled with marvel at the world below, my mind was filled with anxiety of the long parting we have far borne as a family for so long. All of this comes with some hope that we will soon be together for good. A hope that is positive and stronger than any other besiege. We are living through jet lag and zonal differences at the moment. It may take a while, though not too long as we set back into a wonted rhythm. As the sun shines high up in D's land and brings glory of summer and sunshine, so comes this recipe from me to you for greens that were not so familiar to me, atleast not until D introduced me to a land where salad greens make a prominent presence on their aisle in almost every supermarket. I had little known Oakleaf greens, till D randomly picked a pack of salad greens on our regular grocery shopping one day and I instantly fell in love with them there on. They are wonderfully tasty and versatile with cheese and salad dressing of your choice, if paired. 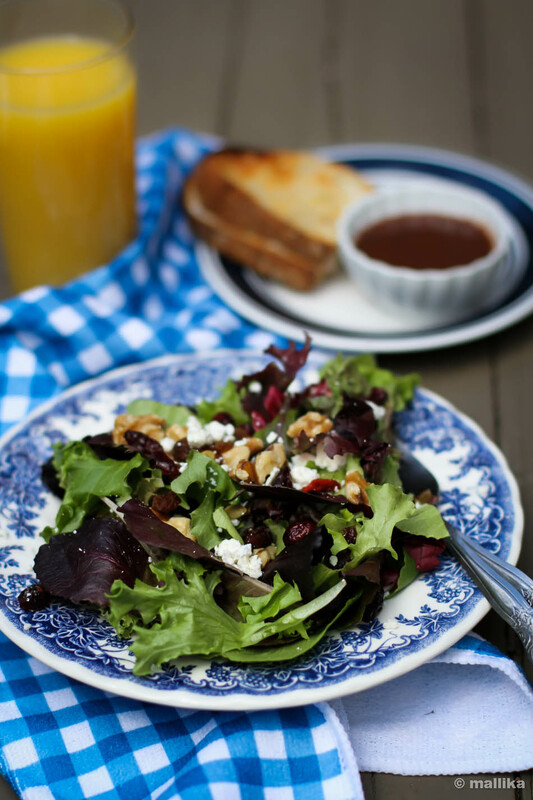 The Strawberry Balsamic Dressing gives a kick of tang against the sweet fruity jam, spiced up with liberal doses of fresh cracked pepper. I suggest you taste the sauce for yourself and adjust the ratio of sweet and tang to your liking. 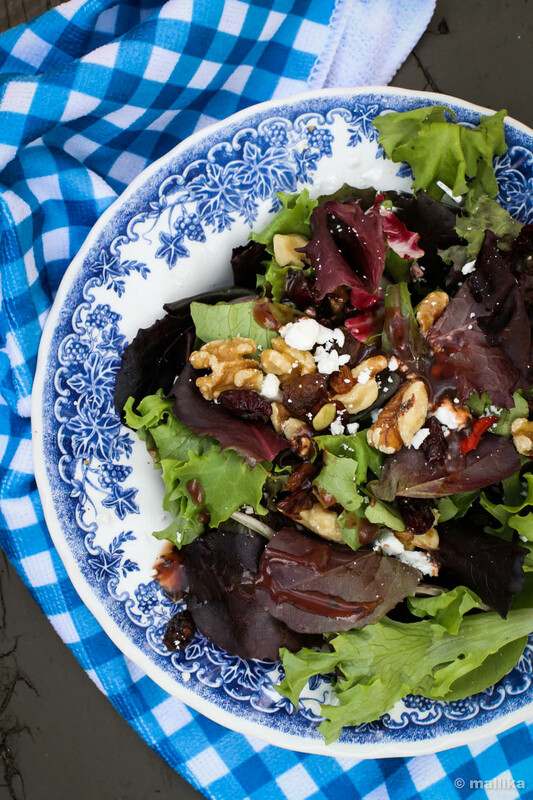 It flaunts well dribbled on crisp lettuce leaves, (either Oakleaf or Romaine would do) and saltiness from fresh feta, adorned with some berries and walnuts. Additionally, I love to serve this salad with cheese sandwiched artisan bread; which obviously does not make it gluten-free, if you abide by it. Choice is really yours. Heat the balsamic vinegar in a small saucepan and bring to a rolling boil. Reduce the heat and simmer till the vinegar reduces to half and becomes thick. Turn off the heat and whisk in the strawberry jam and the extra-virgin olive oil. Season it liberally with salt and pepper. 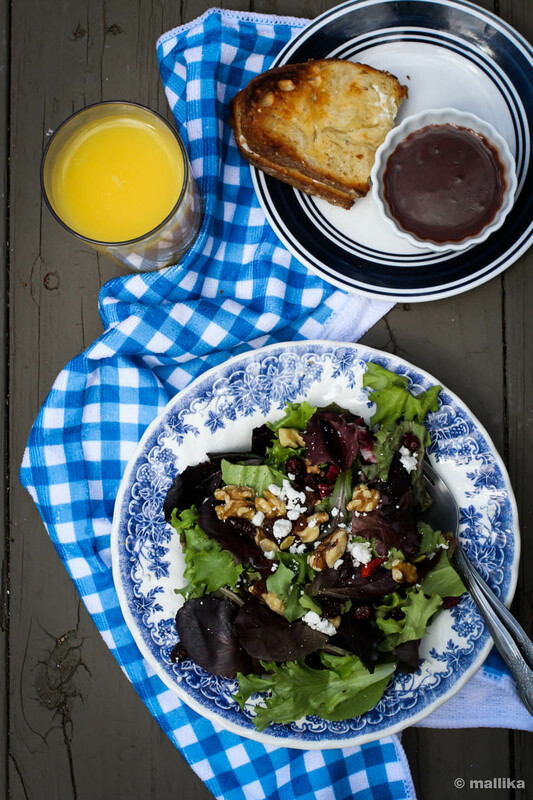 Place the Oakleaf greens along with mix of berries and walnuts in a wide salad bowl. Drizzle the salad dressing and toss it well to coat evenly in dressing. Serve.